In 2013, the Irish Government’s Department of Education and Skills created a new Further Education and Training (FET) agency – SOLAS, to oversee a restructure of the sector into 16 Education and Training Boards (ETB). With a budget of approx. €638M for over 300,000 trainees and leaners, SOLAS’ reforms aimed to provide a clearer line of sight from ETB activity towards national strategic priorities – to create a system more responsive to Ireland’s key skills challenges (including digital literacy, and upskilling) and to better focus provision on key sector skills and growth sectors of the economy. SOLAS’s approach has many similarities with the reforms of our own college sector, and the introduction of the Outcome Agreement process, in which SFC played – and continues to have – a pivotal role. Although the FET landscape in Ireland looks different to Scotland’s (a range of institutions, providers, and types of provision are grouped under the 16 regional ETBs), SOLAS’ reforms also included the introduction of a three-year Strategic Performance Agreements. 10% more learners will secure employment from provision which primarily serves the labour market. 10% more learners will progress to other further or higher education courses from provision which is primarily focused on this purpose. As they managed the first round of these new Performance Agreements, SOLAS colleagues approached us to support reviews of draft Performance Agreements with each ETB at a series of Strategic Dialogue Meetings held in May and June 2018, which involved a range of external experts, including SFC Staff. In June 2018, my colleague Seamus Spencer and I supported reviews of the Louth and Meath ETB, the ETB for Longford and Westmeath. For those unfamiliar with Irish geography, both regions are north-west of Dublin, on the border with Northern Ireland. These meetings were a good mix of challenge and support, and our contribution – informed by our experience with OA discussions – was judged by SOLAS to be immensely helpful. Likewise, from SFC’s perspective it was very useful to get a new understanding of the Irish approach (particularly the use strategic dialogue to discuss agreements; integration of apprenticeships into those agreements, and the extensive use of data), and we could see potential for us to keep working together and sharing lessons learned. Since then SOLAS held a launch event at the end of January 2019 – at which the 16 Performance Agreements and a summary report were published, similar to the ‘Progress and Ambition’ events SFC has held after concluding OAs. 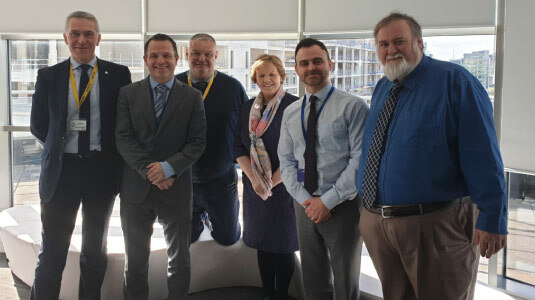 SOALS remained keen to develop the SFC relationships, and in March 2019 I visited Dublin with Michael Cross for further talks, this time including the Irish Higher Education Agency. We discussed performance related funding; the respective experiences of sectoral reform; support for learner pathways; linking FE and HE provision to national and regional skills needs; approaches to quality assurance and enhancement, and student engagement – and much more besides. The learning from the two visits and resultant close dialogue has the potential to further enhance our existing OA process – in particular considering the role of external moderation - along with the application of lessons learnt from the Irish skills system reform process. SOLAS meanwhile are keen for further discussion around our experiences of learner journey planning, FE-HE transition reform and future SFC involvement in the review of their Further Education and Training model. So what can we take away from this and other collaborative experiences, like SFC’s work in Slovenia? Well firstly that other countries are looking to Scotland’s Outcome Agreement model as an ideal foundation for their own reforms, and that’s something we and our partners should be proud of. Secondly, the insight and experience gained through these opportunities to see ‘how the other side lives’ is also influencing how we think about improving our own model, ensuring we don’t rest on our laurels. Thirdly, and perhaps most importantly, it’s proof that we have more in common than what divides us. Look under the surface of any structural or cultural differences and you’ll find people who are just as engaged in doing the best for their students. It’s been a privilege to work alongside them and we look forward to further fruitful engagement.